There’s no denying that the sight of a great actor at work can be a singular pleasure. ‘The Incredible Burt Wonderstone’ has two such actors – Steve Buscemi and Alan Arkin – as part of a gallery of very watchable faces that also includes Steve Carell, Jim Carrey and James Gandolfini. It’s just a pity that watching these men work is the only pleasure the film has to offer. 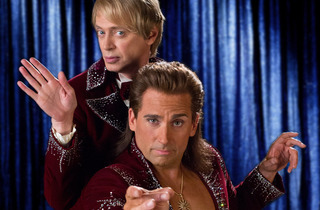 Carell plays the titular magician, who has spent a decade entertaining audiences in Gandolfini’s Vegas hotel with his lifelong sidekick Anton Marvelton (Buscemi). But now audiences are dwindling, Burt and Anton are at each other’s throats, and more daring comics like self-harming David Blaine-clone Steve Gray (Carrey) are on the rise. From the gooey, overlong opening flashback sequence it’s clear that something’s off here: the jokes fall flat, the characters are obvious, the sentiment is too rich. 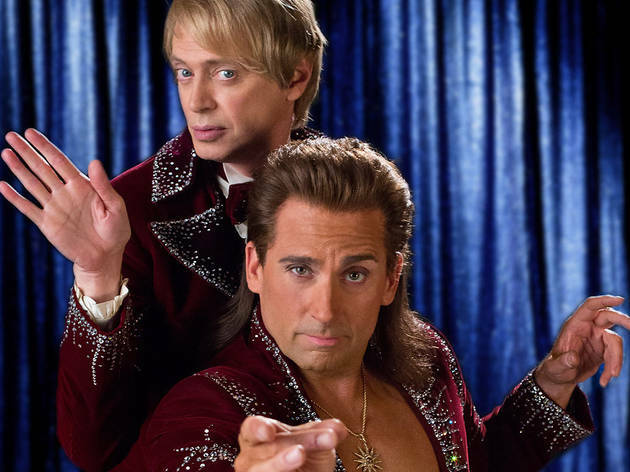 Matters improve with the first appearance of Carell and especially Buscemi who, with his blonde bouffant and eternally optimistic attitude, is the heart of the film. The late arrival of Arkin also adds charm, though his character never goes anywhere, and thanks to a confused, rambling plot, there’s even one point where we’re not sure if he’s actually still alive. In the end, there’s nothing here beyond the obvious riches-to-rags, friendship-lost-and-found, celebrity-rivalry clichés. But the presence of those fine performers means that ‘The Incredible Burt Wonderstone’ stays just the right side of bearable. A desperate disappointment. If you go expecting another Anchorman or Blades of Glory you will be even more disappointed. The tv; superstar magician and the whole Vegas show scene is something that cries out for parady and a sharp film. This dire film is neither. I cannot remember the last time I saw so many good actors so poorly served by a script and a film that will hopefully soon be forgootten. Wilde as the token female is never allowed to develop. Best avoided, if at all possible. A poor 2 star film just.